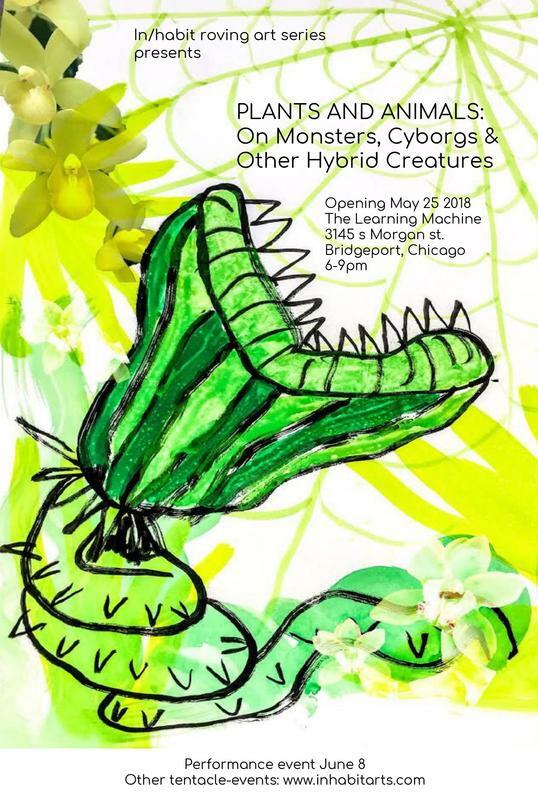 ​​​PLANTS & ANIMALS: On Monsters, Cyborgs and Other Hybrid Creatures is a tentacular curatorial project comprising a series of performance, discussion, screening and broadcasting events on hybridity, ecologies and practices of inhabiting, interrogating Nature, and how we survive together. Hybridity is offered here as artillery against the scourge of centuries old Western binaries. It is an invitation to once again think about the categories of machine/nature/human in more-than-human worlds, together with queer, feminist, and anti-racist politics. +more tentacles to be announced soon! Curated by Rebecca Ladida & the Plants and Animals production team & precious ball throwers: David Sorich, CV Peterson, Marina Cavadini, Aurorae Parker, Emily Eckstrand, Michael Malito, & Alicia Rose (poster art! ), Joseph Ravens, Michael S McKiernan, Jonny Sommer, Whit Forrester, and Kelly Lesniak. Niu B Sushi providing us with delicious sushis for the opening on May 25th!